Kyle Perry, S&T assistant professor of mining and nuclear engineering, is the perfect example. Perry (pictured at right) was studying civil engineering at the University of Missouri-Columbia when he started commuting to Rolla in 2005 to take an explosives class. Perry earned a Ph.D. in mining engineering at the University of Kentucky, where he taught before joining the S&T faculty in 2016. 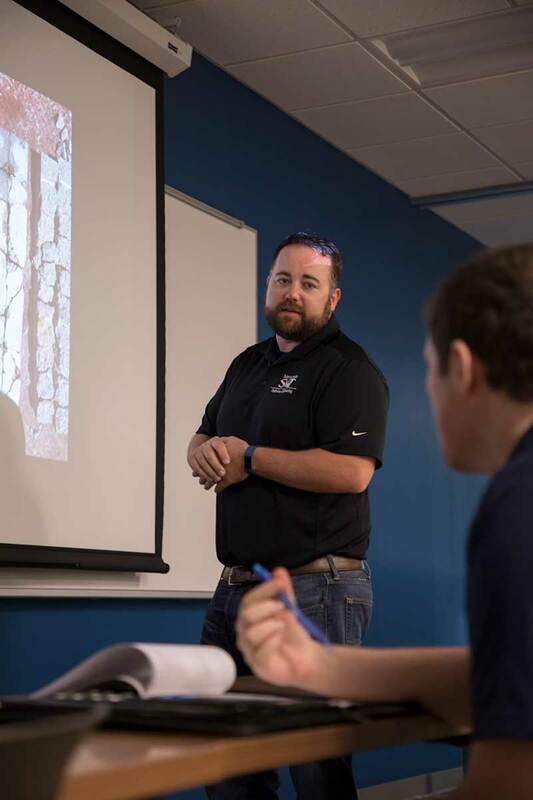 Today, as graduate studies coordinator for explosives engineering, he advises students enrolled in the nation’s first master’s and Ph.D. programs in explosives engineering. S&T began offering an explosives engineering minor in 2005, and soon added undergraduate and graduate certificate programs. Trish Robertson, Engl’99, MinE’05, was the first student to earn a minor. The nation’s first master’s degree in explosives engineering launched in 2010, followed by the first Ph.D. in 2014. Laurin Bookout, CE’09, MS ExpE’11, PhD ExpE’15, was the first graduate of the doctoral program, and Martin Langenderfer, MinE’16, is a current student. “There always seems to be a new question to answer or challenge to tackle,” says Bookout, who discovered her passion for explosives as an undergraduate and now works in weapons effects testing for ARA, an Albuquerque-based scientific research and engineering firm. Paul Worsey, professor and director of explosives engineering, describes the growth of the program as organic. S&T now offers 20 classes in explosives engineering, a depth of focus unmatched by any other university. Most classes are offered both online and on campus. The number of students with S&T credentials in explosives is significant, particularly for a young program: 142 minors, 50 undergraduate certificates, 139 graduate certificates, 71 master’s degrees and three doctorates since the program’s inception. Most students who earn explosives degrees still take jobs in mining, but a growing number work in defense, law enforcement and pyrotechnics. Kevin McNeill, MS ExpE’14, is chief of research and development for the National Center for Explosives Training and Research in Huntsville, Ala., operated by the federal Bureau of Alcohol, Tobacco, Firearms and Explosives (ATF). S&T’s graduate certificate in explosives engineering is now required training for ATF-certified explosives specialists. The newest degree program, a master’s in explosives technology launched this year, is already enrolling students from the ATF and other federal agencies who lack engineering backgrounds but need advanced training in explosives.